For comparison, the field mouse is small, usually brown or gray and nests mostly in the winter. Field mice breed especially quickly, that means a few mice can be twenty or more in a few months. Look for small holes and droppings around the base of the walls, primarily near any food or heat source. The roof rat, on the other hand, is black and prefers to climb and build nests in roofs or attics; they tend to look for warm, dry, accessible places and will chew through wood and wires to get to it. Roof Rats are some of the most destructive rodents and can even chew through multiple layers of plywood. Norway rats are the largest rodents around, usually brown, and burrow. They will enter your basement or crawlspace and are attracted primarily to cluttered dry spaces. These rats are omnivorous scavengers and are attracted by garbage and other refuse. Weighing up to a pound, these rats are not to be underestimated. They can and will do a lot of damage to your property if not handled quickly by a rat exterminator. It isn’t that these rodents themselves are dangerous, but the diseases they carry can be. Without rat extermination, these small animals will continue to breed and create waste, which causes a bigger problem the longer you wait. As animal debris accumulates, toxic mold can form as well as wood rot and rust. Fleas and ticks that come with the rats can infest the structure and any cloth items therein. All of this waste, mold, rot, as well as other invaders, can infest your walls, floors, and ceiling. 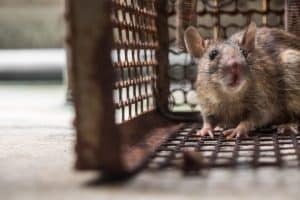 At Flatliners Pest Control, our staff has been dealing with Las Vegas rat removal for years. Why not use our knowledge keep you and your property safe and healthy? Our rat control specialists have experience with even the worst type of infestations. Let us handle your rat problems. Don’t hesitate to call or contact us online today.